Bush presides over the School Land Board, which has feuded with the State Board of Education over the disbursement of hundreds of millions of dollars from Texas' education endowment. 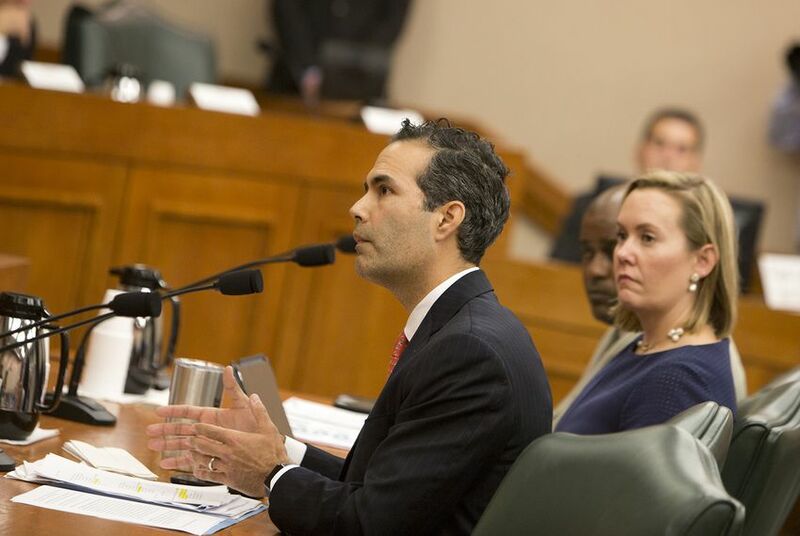 A simmering school-finance battle came back to life Wednesday in separate hearings that brought up Texas' educational endowment, the largest in the country. While lawmakers in the Capitol recommended making significant changes to the fund, members of the State Board of Education lamented in their own meeting that the School Land Board has so far stood by a funding decision they announced in August that immediately spurred controversy. "They need to reconsider now," state Sen. Paul Bettencourt, R-Houston, said Wednesday night. In past years, the land board sent money from that endowment to the State Board of Education, which earmarks some of the dollars for textbooks, and to the Available School Fund, a stream legislators tap to pay for classroom expenses. This year, the board opted to pump $600 million directly into the Available School Fund, bypassing the education board for the first time. The maneuver, which Bush said would more efficiently help school children, immediately upset education board members. By skirting the elected body, “instructional materials will be cut by $300 million and property-poor districts, which make up the overwhelming majority of school districts in the state, are going to see a reduction,” said education board member David Bradley, in an interview. Facing pushback, Bush had initially seemed open to revisiting the decision. But last week, as he cruised to re-election, a land board meeting planned for Nov. 6 was quietly cancelled. And with its cancellation came confirmation that the $600 million decision would almost certainly not be reconsidered before the State Board of Education's meetings this week. Friday marks a critical cutoff; it's the date the education board will largely lock in its funding rates for the next biennium. The item could be revised at an emergency gathering, but on Wednesday board members likened the back-and-forth with the land board to a “financial game of chicken” that could have been averted. A spokesperson for the General Land Office, Karina Erickson, said the early-November meeting was moved due to scheduling conflicts and that she couldn’t predict what the outcome of the rescheduled gathering would be. It has been rescheduled for Nov. 19. “As a former teacher, Commissioner Bush understands the value and importance of funding our public education systems,” she said. “Our community should be paying attention to what is going on in our classrooms." When announcing the disbursement, Bush had said $600 million was "a meaningful number that can make a difference in reconciling budget numbers." "The fact that this board can move in a historic fashion and make a $600 million distribution immediately to the Available School Fund to aid the Legislature," he said, shows the public the high-profile returns the board has achieved. The funding fracas has occurred alongside a broader discussion about whether changes should be made to how the state manages its public education endowment, called the Permanent School Fund. “I want to be very, very clear: This isn't a criticism of Commissioner Bush or the agency's investment staff. It's a criticism of the structure the Legislature created,” he said. The permanent fund was endowed in 1854 with $2 million in cash and millions of acres of Texas land, and its value shot up with the discovery of oil, and as fracking technology advanced. By 2017, it was worth more than $41 billion. Historically, the three-member School Land Board, housed in the General Land Office, oversaw the fund’s lands, and it would send proceeds from the lands’ oil, gas and mineral royalties over to the State Board of Education. The education board would then feed the returns into its own investment portfolio, and make annual disbursements to the Available School Fund. But over time, two tweaks dramatically reshaped the system. The first change to the fund came through a bill passed in 2001. It didn’t seem momentous at the time. At an April hearing for the measure, its author, then-state Rep. Robert Junell, said he was carrying the bill for then-Land Commissioner David Dewhurst, and it quickly sailed through the committee. The thinking behind the legislation was simple. Until that point, the State Board of Education invested the funds in low-risk areas like stocks and bonds. But it could be producing more money for the state, a bill analysis suggested, if the land board itself could invest in assets like real estate. There was another component to the measure, included at lawmakers’ insistence, Dewhurst said. The biennium was marked by a particularly tight budget cycle and a provision in the state’s appropriations bill, buried on page 921, nodded to how a shortfall could be filled. Upon enactment of the new law, it read, the General Land Office “shall sell state real property to be purchased by the Permanent School Fund in a minimum amount of $150 million,” with proceeds going into the state’s general revenue. The second change to the fund came soon after. Under the auspices of good business, the education board was given increasingly broad leeway in the early 2000s to diversify its investments. Once relegated to stocks and bonds, they expanded their portfolio, hired an investment manager, and began snapping up real estate investments. By 2007, the Permanent School Fund had grown fat with returns. But Jerry Patterson, a former state lawmaker who served as land commissioner at the time, noted the amount being sent over to the Available School Fund had stayed relatively stagnant. Why not let the land board transfer money directly to the Available School Fund? Patterson pitched the idea to lawmakers that year. It would be like a “bonus,” he said at a hearing — a supplement the Legislature could use for public education. The measure passed. “I think the intent was to have flexibility,” said Trace Finley, who worked for Patterson in the Land Office. “That's why we have the ability to do both” — to distribute funding to the State Board to invest in their portfolio, or to give directly to the Available School Fund. Now, redundancies have been built into the management structure of the fund, with both the education and land boards managing Permanent School Fund assets, paying fund managers, investing in real estate, and making payouts to the Available School Fund. “If we consolidate the two pieces of the Permanent School Fund into one, we can put more money to work for the benefit of our school children,” Watson said at the hearing Wednesday, which focused only on the School Land Board. As part of the sunset review process, he and other lawmakers proposed a battery of changes, including adding two members to the land board who would be nominated by the education board and selected by state leaders. He said more expansive measures would be considered during the legislative session that begins in January. Erickson, the General Land Office spokesperson, said Bush opposes changes to the management of the fund, but believes it “requires prudent stewardship and oversight.” In a statement after Wednesday's hearing, Bush said the land board "remains committed to working with the [education board] to ensure we continue to act in the best interest of Texas public schools," and to working with lawmakers. Bettencourt, the Houston lawmaker, said structural or organizational issues regarding the fund could be addressed by the Legislature. But he urged the land board to send money to the education board for the next biennium. "If we get to Senate Finance Committee meetings, it won't be just Sen. Bettencourt and Sen. Watson complaining about it," he said. "That's my prediction." Updated: SBOE Members: Why Not Use the Permanent School Fund?